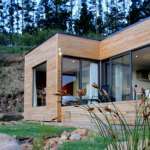 The ecomo home is a compact home designed for modern, simple living in collaboration with nature. The design is based on basic and sustainable green design principles. The ecomo home offers a low-maintenance, modern, well-designed green housing alternative.